Millard was the first draft choice of the Vikings in 1984 but spent his rookie season with the Jacksonville Bulls of the USFL. He joined Minnesota in 1985 and recorded 11 sacks that year and had another 10.5 in ’86. He became the key figure in the middle of Minnesota’s talented defensive line and was a consensus first-team All-NFL and Pro Bowl selection in 1988. Vikings went 10-6 to finish first in the NFC Central while allowing the fewest yards in the NFL on defense overall (4184) and in passing defense (2501 yards) as well as leading the league in sacks (71). Lost NFC Divisional playoff to San Francisco 49ers (41-13). Millard’s 1990 season ended when he suffered a significant knee injury in the fourth game and the resulting two surgeries cost him all of ’91 as well. 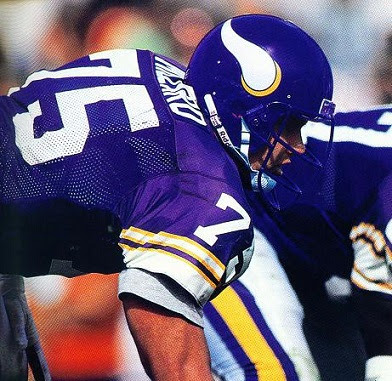 The Vikings dealt him to Seattle for 1992, but he played in just two games and moved on to the Packers. Millard finished up with the Eagles in 1993. Playing in eight seasons in the NFL, he accumulated 58 sacks (53 of them with the Vikings). At his best, he was an explosive pass rusher from the middle of the defensive line, but his promising career was cut short by injury.